At last, Cameron’s got it. He finally varied his tactics at PMQs today. Brown had no warning. That made the change doubly effective. First Cameron asked two easy-peasy questions about salt which the PM answered in his favourite strain of complacent pomposity. At one point I think I heard him say the nation’s supplies are so crucial that he may create a ‘salt cell’ in the middle of Britain so we never again run low on this vital condiment. Cameron then tossed aside the salt-pot and declined to ask a further question. Brown was unsettled by this. Realising the worst was yet to come, he waffled nervously through an answer to the next question from Dari Taylor (Lab, Stockton South) which focused on adoption and fostering. This is a ‘major challenge,’ burbled Brown, adding more phrases of inaudible guff. Clearly the ‘major challenge’ on his mind was Cameron’s upcoming attack. Having kept the PM waiting Cameron got up and aimed a knock-out blow at his fatally wounded prey. ‘After the events of last week,’ he pondered mildly, ‘how will he change the way he governs?’ Brown surprised everyone – not least himself – by turning this to his advantage. If Cameron wanted to talk about differences, he asked why the Tory leader looked so different from his campaign poster. ‘If you can’t get your photograph right, you can’t get your policies right.’ This heartened the Labour benches but Cameron came back strongly, taking up the PM’s photographic theme. How many Labour MPs, he asked, intended to put Brown’s lovely mug on their election literature? ‘Come on. Hands up.’ Quite a few lemming-like loyalists duly hoisted their mits. Cameron counted them. ‘Four!’ he brayed. ‘Only four.’ (It was more like thirty but this misrepresentation can be regarded as a patriotic gesture.) ‘He’s been airbrushed out of the whole campaign!’ Cameron then tried to make sport with the failed coup last Wednesday and the cabinet’s tardy expressions of support. This tactic fell flat. It lacked spontaneity. But Brown’s quip, ‘He’s getting much redder than he is on his photograph,’ made everyone laugh. After these improvised skirmishes the leaders reverted to prepared weapons. Cameron mocked the PLP as ‘too disloyal to support him, too incompetent to remove him,’ and Brown deployed his usual catcalls. Tax cuts for the rich, the wrong action on the recession, and ‘a return to the policies of the 1980s.’ That’s code for Thatcherism, of course. It’s curious that Brown, in his ceaseless quest for dividing lines, refuses to use the T-word even though it’s the most divisive term in the modern political lexicon. Today we saw an angry, witty, energetic contest. Both fighters drew, and shed, blood. 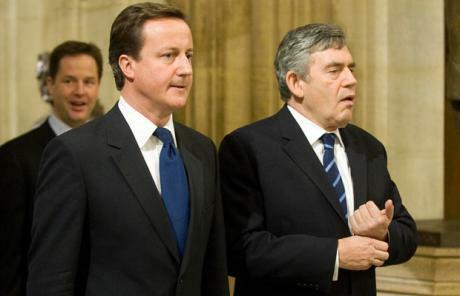 Cameron made Brown sweat but he was surprised when the PM didn’t crumple beneath his opening hammer-blow. The Tory leader will be glad that when he sat down after his sixth slug he wasn’t greeted by Labour cries of ‘More, more!’ That’s something. But, given that this time last week Brown had his head in a noose, Cameron should have done better.